Cercle de la Voile de Vaux-sur-Seine (CVVX, website) is based in Vaux-sur-Seine, a small town located on the river Seine, downstream from Paris. The burgee of the CVVX (photos No. 3 and No. 11) is a white triangular flag with two red triangles placed vertically along the hoist. The burgee (photo) hoisted on buoys used during the Ruban Bleu race, 5 October 2008, is charged with the blue letters "CV" and "VX", placed vertically in the upper and lower red triangles, respectively. The municipality of Follainville-Dennemont (1,912 inhabitants) is located on the right (northern) bank of the river Seine, c. 50 km downstream from Paris and 6 km from the town of Mantes-la-Jolie, which is located across the river. The village of Dennemont, where the philosoph Condorcet (1743-1794) had his castle, was part of the municipality of Saint-Martin-la-Garenne before being merged with Dennemont to form the today's municipality. The Cercle de Voile de Dennemont (CVD) is based on a small island; the stretch of the river allocated to the club is located between kilometric points (PK) PK 112 and PK 116. The club was founded in 1926 and its club house is the former ballroom of Auberge du Vieux Moulin (Old Mill's Inn). The CVD website shows a possible club flag, white with an off-centred cross made of blue-white-red stripes. The burgee of the club is shown on the emblem of the club, to be seen on the posters advertizing the races organized by the CVD (Coupe Vent d'Ouest, Coupe de la Seine and Trophée la Parisienne Muscadet - Coupe Coillard). It is a triangular version of the possible flag with the canton horizontally divided blue-red. The Cercle du Motonautisme Classique (CMC; website), based at Villers-Saint-Frédéric, near Versailles, was founded by Henry-Jacques and Christine Pechdimaldjian. 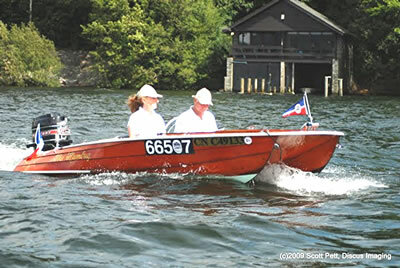 The club groups owners of racing and leisure powerboats involved in the preservation of the heritage of classical powerboating. They participate to international meetings, such as Hélice classique held in Geneva; another main task of CMC is research and archiving of historical documents on powerboating. The burgee of CMC (photo, photo, photo) is horizontally divided blue-red with a thin white horizontal stripe in the middle, in the middle a white disk charged with a black propeller. At the end of the 19th century, yachting started in France in the valley of the Seine. France has more than 5,000 kms of coasts, but at that time these coasts were very far from Paris. Open-air cafés and dance halls called guinguettes flourished on the banks of the Seine and of the Marne, attracting a wide clientele. People from the upper-middle classes from Paris mixed with factory workers, artists and hoodlums. Swimming, rowing and boating were popular activities. Small shipyards were established on the river banks, in which new kinds of sailboats were built. Rapidly, famous naval architects like Gustave Caillebotte (also known as an Impressionist painter, an art patron and a distinguished yachtman), Chevreux, Tellier and Texier, launched their new ship models on the Seine. Several sailboat owners lived in Chatou, downstream of Paris, where they founded in 1902 the Club Nautique de Chatou (CNC). They built a clubhouse on the Impressionists' Island, a small island where the Impressionist painters and their friends met in the Fournaise Inn (Maison Fournaise, now a museum and still an inn). 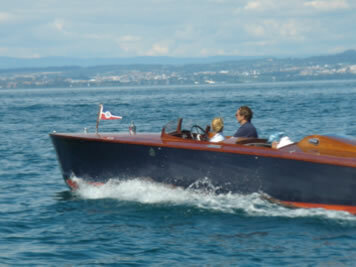 The architect Texier designed in 1899 a dinghy called Immuable (Immutable), based on the model of the American Lark. The Immuable was renamed Monotype de Chatou (Chatou One-design sailboat), nicknamed la Punaise (the Bug) because of its flat shape. The members of the CNC were funny guys and received the nickname of Chatouillards, based on Chatou and chatouiller, to tickle. The CNC nearly extincted after the First World War, but its nine remaining members were able to maintain and promote yachting activity. In the late 1920s, it appears that the site of Chatou was too small for the club, and it was decided to move downstream to Meulan, where the yachting races of the 1900 and 1924 Olympic Games had taken place. Thanks to the generosity of club member Armand Esdars, 4 ha of land were purchased and a new clubhouse was inaugurated in 1929. 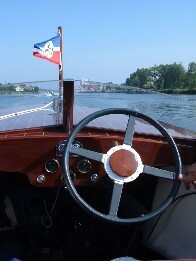 In 1930, the members of the CNC decided to find a new boat since the Monotype of Chatou had became obsolete. They bought a license for the Shark boat from the shipyard of Abo (Finland). The Shark was renamed Aile (Wing). On 18 June 1939, the CNC was renamed Yacht Club de l'Île-de-France. The YCIF, unfortunately located close to the airfield of Les Muraux, was bombed on 3 June 1940 by the Germans, who believed it was a seaplane base. In 1944, the Americans made the same mistake. The clubhouse was reconstructed but the YCIF faced a big crisis in 1964. Following Éric Tabarly's victory in the Transat race, most yachtmen were attracted by sea racing and abandoned inland waters. In the 1980s, Pierre Bogrand, who had introduced the Optimist boat in France, decided to restore the last Aile boats kept by the YCIF and to build new ones. The flag of the YCIF ( photo) is white with a red horizontal stripe in the middle and two blue vertical stripes; the red stripe is twice higher than the blue ones. This flag was designed for the then CNC was designed by the fashion designer Paul Poiret (1879-1944). One of the early and most famous members of the CNC, Poiret organized "descents" (descentes) of the Seine, during which the ladies and supply sailed on his personal barges Amour (Love), Délices (Delights) and Orgues (Organs). The burgee (photo) of the YCIF is a triangular version of the club's flag, in 1:2 proportions, and with the red and blue stripes equal in size. The Yacht Club de Porcheville (YCP) was founded in 1953 in the town of Porcheville, located on the river Seine 35 km west of Paris, by a few fans of the single-manned sailing dinghy Europe. The members of the YCP still sail on Europe but also on 420, 470, Laser and Caravelle. They can sail between the island of Rangiport (km 102 of the Seine) and the EDF power plant (km 105), a stretch of smooth water of 3 km x 250 m.
The flag of the YCP (graphic) is horizontally divided blue-white-blue with the blue letters YCP in the white stripe. The posh town of Le Pecq (17,063 inhabitants - Alpicois) is located 22 km west of Paris. Crossed northwards-southwards by the river Seine, Le Pecq is the birth city of Jacques Tati (Jacques Tatischeff, 1907-1982), one of the most fascinating French movie makers (Jour de fête, 1949; Les vacances de M. Hulot, 1953; Mon oncle, 1958; Playtime, 1967; Trafic, 1971). Yacht Club du Pecq (website) was founded in 1967; its club house is located on the right bank of the Seine and its members can sail between the islands of La Loge and Corbière. The burgee of YCP (photo) is horizontally divided blue-white-light with the emblem of the club in the middle. The emblem of YCP is a light blue disc bearing a stylized combinations of the initials of the club name.